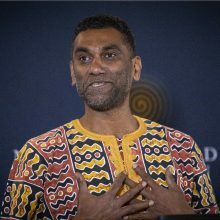 Kumi Naidoo is a life-long social justice and environmental campaigner hailing from South Africa. Born in Durban in 1965, Kumi’s first taste of activism came at age 15 when he organized and took part in an anti-apartheid protest that saw him expelled from his school. As a result of his continued anti-apartheid activism, he was forced to live in exile in the UK in 1986. He returned to South Africa in 1990 to work with the African National Congress. He went on to hold multiple leadership roles in civil society and global organizations, including as the Executive Director of Greenpeace.